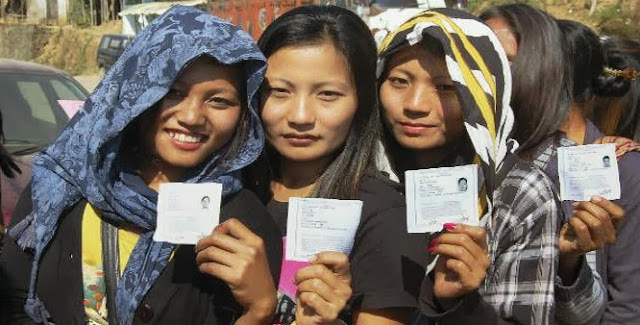 Aizawl, Oct 29 : Going by numbers, the Mizoram polls are going to be a women's show all the way, with more female voters (3,49,506) than male (3,36,799) being part of the electorate. But though the number of female voters is higher, if history repeats itself, women candidates are unlikely to squeeze any advantage out of the numbers. So far, only a couple of possible women candidates are clearly identifiable. The 2008 Mizoram election featured nine women candidates, but none of them made it to the state assembly. Former TV anchor and councillor of Aizawl Municipal Council Lalmalsawmi has already made her presence felt in Tawi constituency where she will be up against the Congress No 2, present home minister R Lalzirliana. The other woman in the fray is Congress youth president C Lalawmpuii, who's the daughter of one of the most prominent leaders of the Mizoram Congress - C Chawngkunga. There is a chance that she would be contesting from the Champhai North constituency. Apart from these two women, a few names have started to surface, but no clear information is available on their candidature. Some of the names are the former president of an apex women's body Mizo Hmeichhe Insuihkhawm Pawl (MHIP), B Sangkhumi; Mahila Congress Committee chief Tlangthanmawii; and former underground cadre B Lalzarliani. But there is no confirmation of these three women joining the fray as yet. It's ironical that women, who are accorded a respectable position in the Mizo society and form a large part of the workforce, haven't been able to make their mark in state politics. While about 45 per cent of Mizoram's total female population work, in politics, their presence is restricted to barely three per cent. "It's a matter of concern that even though women are highly respected in the Mizo society, politics are way out of their league at the moment," said H Lalchhandama, a local writer. "Statistics of past elections do not favour the women candidates, but if the women voters choose to vote for them on the basis of their gender, the female candidates have a chance of being successful," he added. The first woman legislator of Mizoram, K Thansiami, was elected to the legislative assembly in 1984 on a Mizoram People's Conference ticket. She beat veteran politician C Silvera, who later became Union minister for health. She won by a convincing margin in Aizawl West constituency. The last Mizo woman legislator, Lalhlimpuii, was elected to MLA in 1987 and was made minister of state in the late chief minister Laldenga's ministry.